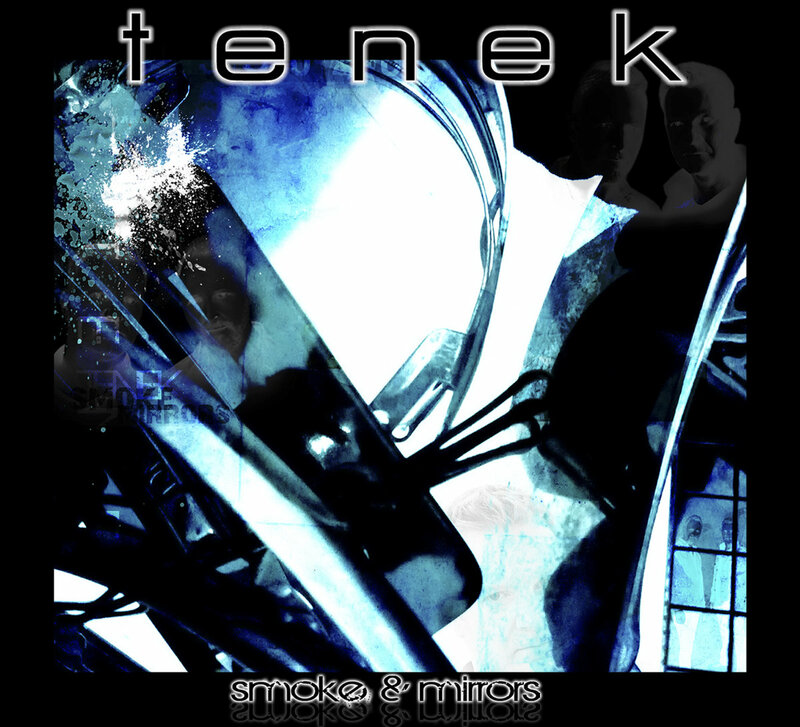 Tenek make a welcome return with their new album “Smoke And Mirrors”, the follow up to the 2010 album “On The Wire”. The first thing that is immediately noticeable is how much fuller the sound is, which is down to the fact that some new musicians have joined the “Tenek family”. Drummer Steve Clark who’s contribution to this album should not be underestimated, in addition on Bass on some of the tracks are Michael Steer, Paul Jackson and Sam Morrison. It definitely adds to the powerful sound of the album. The opening track “Everything Lost” is truly excellent with some superb bass-lines and synth parts, it’s a well rounded track with a strong chorus line, a potential single maybe? “Fear For Nothing” is a rockier sounding track with punchy synths and some very impressive bass by Michael Steer, a strong vocal too and the drums certainly make an excellent impact with this track. “Another Day” was the first single released off the album and it is brilliant, i’m immediately drawn to that “Numan” style string synth, some great accomplished guitar work as well, a solid track that rates as one of Tenek’s best tracks. Next is their recent single “What Kind Of Friend”, which fuses electronics and guitars perfectly and of course has a great sing-a-long chorus, a track I would think is a firm live favourite. “Blue Man” has a great synthetic intro and is a track where the drums come into their own, this is more electronic and has lush layered synth sounds, it’s a slower paced track and for me is an instant favourite. “Headlights” has a Duran Duran influence on it, with a hint of a Numan influence also thrown in for good measure, the blend of electronics and guitars again is perfect, this has moments of pure dance bliss as well as atmospheric sections, a very interesting and impressive song. Love it! “A New Foundation” was originally included on their “Another Day EP” and is a track I have always liked, quite anthemic in its delivery, another fine synth part in the chorus and I love the piano part in the middle 8, which kind takes the track into another direction, before the chorus kicks in again.”Sunlight” is a track that veers more to their electronic side, a well constructed track with some great sounds, it’s a different sounding track, with some impressive ambient strings that really do add to the atmospherics of the track. “Immitation Of Life” is a superb track, probably their most commercial track on the album, great mix of guitars and synths, an uplifting chorus that is a throwback to Numan’s “Replicas” album sound. “Soloman” is a very interesting track, it’s again a lot more electronic than some of the tracks on the album, I like the bass-line (very Ultravox) and that beautiful, yet simple melody line, it’s quite a moody track and is definitely one of the highlights on the album and for me the best track on the album. The album closes with the title track of the album, which again has a heavy Gary Numan influence running through it, a Mid paced track that once again makes brilliant use of both their electronic side and their more rockier side. Tenek are masters at getting the balance between the two absolutely spot on. An album 5 years in the making but the result has been well worth the wait, the songs are strong and the production is outstanding. It is an album that is diverse and clearly shows the development in Tenek’s sound. Personally I think this is their best album to date and definitely worth investing in. The album is available on CD and is also available as a Digital Download via Bandcamp.